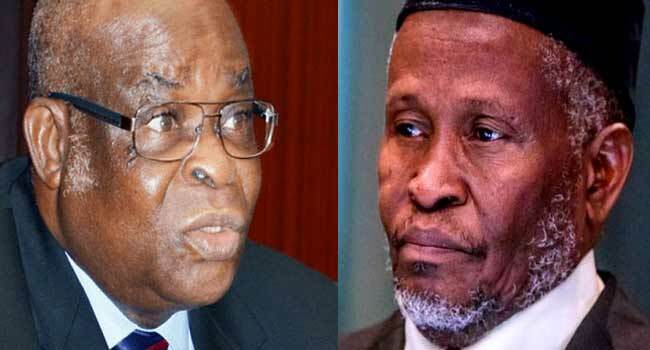 The National Judicial Council (NJC) has set up a panel to look into the petitions against the suspended Chief Justice of Nigeria (CJN), Justice Walter Onnoghen, and the acting CJN, Justice Tanko Mohammad. NJC Director of Information, Mr Soji Oye, revealed this in a statement on Monday. “Members resolved to constitute into the Preliminary Complaints Assessment Committee in accordance with Regulation 17 of the National Judicial Council Judicial Discipline Regulations, 2017 and report to Council on the 13th of February 2019,” the statement said. Mr Oye said the Council also received a new petition against Justice Onnoghen by the Economic and Financial Crimes Commission (EFCC). • NJC constitutes Preliminary Complaints Assessment Committee under Regulation 17. • To reconvene on Wednesday, 13th February, 2019. • Forwards new petition by The EFCC to Hon. Mr Justice W.S.N. Onnoghen, GCON for response within seven (7) days. The National Judicial Council reconvened today in an Emergency Meeting to consider the responses of Hon. Mr Justice W.S.N. Onnoghen, GCON and Hon. Mr Justice I.T. Muhammad, CFR to the three petitions written against them. Council also received a new petition written by the Economic and Financial Crimes Commission (EFCC) against Hon. Mr Justice W.S.N. Onnoghen, GCON and forwarded it to him for his response within seven (7) working days. Council reaffirmed its confidence in Hon. Mr Justice Umaru Abdullahi, CON and continues under his Interim Chairmanship.